How to Define Hamilton’s Neighbourhood Boundaries and Localisms: East, West, North, South, Upper and Lower? As a Hamiltonian, I’m often surprised when Barton and Sanford is “north end”, City staff use “north end” to describe the industrial sector between Sherman and Woodward, apartment buildings along Queenston Road in Stoney Creek are “east end”, the stadium is “east end”, Westdale is called Hamilton’s “west end”, Parkdale and Queenston is called “Stoney Creek”. 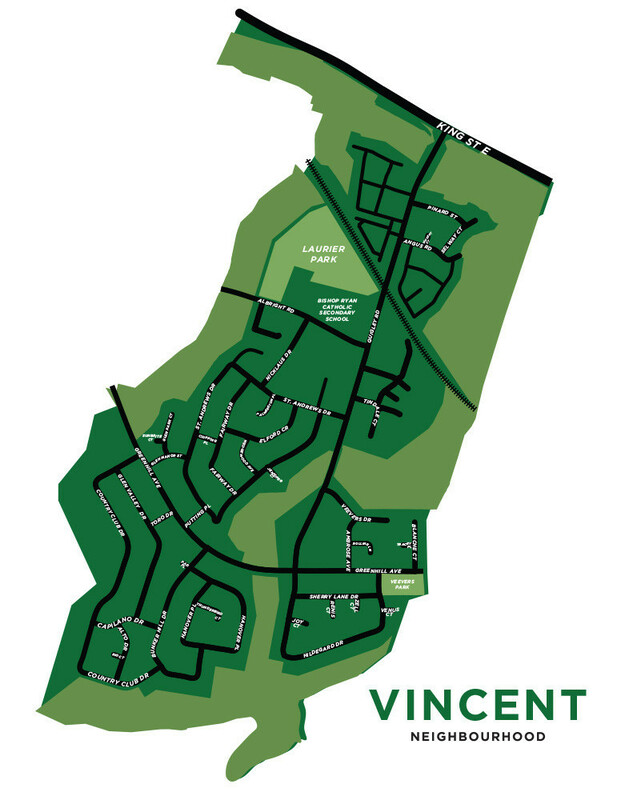 Arguably, the entire lower city is now “North Hamilton”, especially with the rapid expansion of Hamilton south since the opening of the Lincoln Alexander Parkway, growth in Upper Stoney Creek and Glanbrook, and the inclusion of agricultural lands to the south of the urban boundary. As a local journalist who is a Hamiltonian, I have strong opinions upon when these terms should be used. People who live in these communities – especially those along boundaries that are not exactly clear and even when they boundaries are clear – have stronger opinions still. North End is a most often used to indicate – second hand – that a neighbourhood is poor or crime ridden. It’s usually dropped when referring to Hamilton’s true North End in a positive story. When writing about the booming real estate of the neighbourhood that is geographically defined as the North End (North of the CN mainline, west of Wellington), the term Hamilton’s waterfront is often used to clarify the use of North End for geographical purposes. This second-hand negative meaning is why Barton and Sanford is “north end” in a crime story, or “north end” to refer to Jimmy Thompson pool within the context of the area being a lower income neighbourhood. 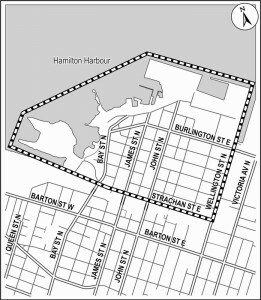 City staff will refer to pollution in Hamilton’s north end, or poverty in Hamilton’s north end when they are referring to neighbourhoods well outside of the traditional north end – even when the term was used commonly to refer to all residential areas north of the CN mainline tracks. Those who grew up in the north end and found successful careers use the term to denote the adversity they’ve overcome and the character that was built growing up in a poor community where personal honour was the most important currency, since money was hard to come across. 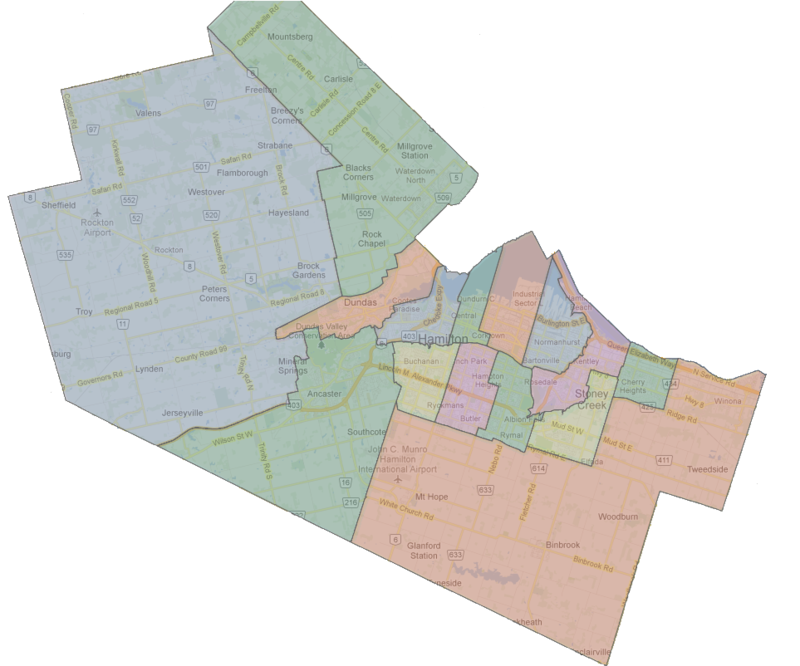 Hamilton Police Divisional Boundaries in 2015. East End is an interesting term to define both geographically and for social meaning. Personally, I’ve decreased my use of the term in favour of using neighbourhood names, key landmarks, and intersections to place a story in East Hamilton. To me, East End refers to the former “blue collar” culture of an area where steelworkers lived closer to the factory that provided plentiful good employment and the strong union culture that came from those neighbourhoods. I use “East Hamilton” for stories east of Gage Avenue, but mostly past Ottawa Street. I personally feel that Ottawa Street belongs to both East and Central Hamilton. Ottawa Street also serves as the boundary between Wards 3 and 4, but I’ve never found ward boundaries to be useful for splitting geography in the Lower City. I can’t quite define “East End” in my mind. If there is an “East End”, surely its the area east of the Red Hill Valley? However, I don’t hear people living north of Queenston Road from the Valley to Centennial Parkway (which I still call “Highway 20”) refer to themselves as “East End”. South of Queenston, they don’t either. South of King, the “Davis Creek” name is taking hold among those who identify with Hamilton and other parts of East Hamilton here identify themselves with Stoney Creek. There is no area which I can clearly identify as “East End” today. What is the east boundary of East Hamilton, when does it become Stoney Creek? This is my favourite boundary because of how the political boundary is not disputed, but the localisms are. 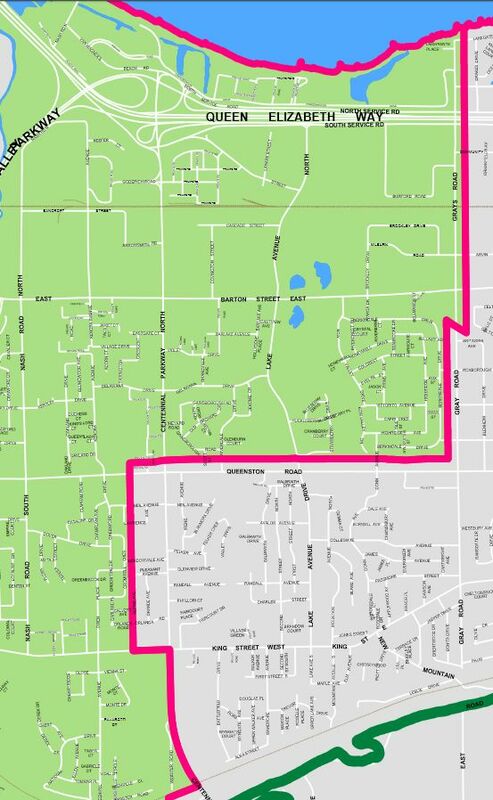 I ran in Ward 5 for School Board Trustee in 2000, and this was the first time I realized just how strongly some residents feel about an affinity towards Stoney Creek – despite officially living in Hamilton. The homes that were in Gershome when I ran in 2000 identified more with Stoney Creek than Hamilton from my subjective experience. Going door to door, I didn’t encounter many people referring to themselves as being part of Stoney Creek in that neighbourhood as well..
Riverdale is interesting because the boundary between Hamilton and Stoney Creek isn’t Queenston Road itself, instead it runs along an old survey line just north of the street. Everything else north of Queenston Road is in Hamilton’s Riverdale neighbourhood. 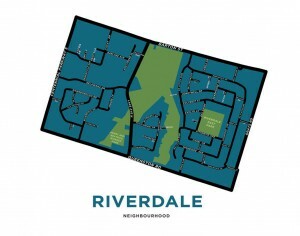 I find the residents of detached homes in Riverdale – especially those east of the Stoney Creek waterway – identify with Stoney Creek. 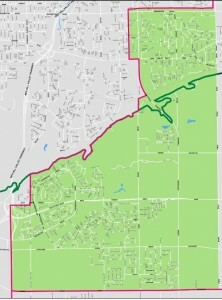 Another interesting localism is the naming of the portions of Stoney Creek above the escarpment. Is it Upper Stoney Creek or Stoney Creek Mountain? Growing up, I always heard it referred to Upper Stoney Creek. Its neighbourhoods as Valley Park or Satellite City. I never heard Stoney Creek Mountain. A Google search of the City of Hamilton website shows a fairly even divide between the two terms with 79 results for “Upper Stoney Creek” and 61 results for “Stoney Creek Mountain”. Over at TheSpec we find 517 results for “Upper Stoney Creek” and only 59 results for “Stoney Creek Mountain”. Most of the “Stoney Creek Mountain” usages are more recent, indicating a possible change in terminology that could be reflective of the increased inflow of new Hamiltonians or the direct connection of Upper Stoney Creek to Hamilton Mountain following growth that came with completion of the Red Hill Valley Parkway. A search of the Hamilton Spectator archives going back to 1991 finds 538 results for “Upper Stoney Creek” and 266 for “Stoney Creek Mountain”. I’m sticking with Upper Stoney Creek for now, but accept our localisms change. I expect Stoney Creek Mountain will become dominant, especially with growth in Binbrook creating more of an east-west flow of people on the escarpment compared to the past when residents of Upper Stoney Creek had to travel down Highway 20 to Eastgate for shopping and services. Within Ward 6, I use the Linc, Kenilworth Access, and Mohawk Sports Park as key landmarks. As Mountain streets are on a grid pattern, I’ll almost always note the nearest major intersection. For Ward 7, the Linc and Limeridge Mall are major landmarks. Stories in the Concession Business Improvement Area are noted as being there. I’ve seen Concession referred to as the North Mountain. I find the term confusing and don’t use it. Major intersections are noted in most stories. I’m just going to say it, I can’t stand the term “West End” that is sometimes used in local media. There’s Westdale, West Hamilton, Ainslie Wood. West of the 403, it’s either Westdale, Ainslie Wood, Main West for the stretch of multi-res buildings approaching Wilson Street, and McMaster for the campus itself. 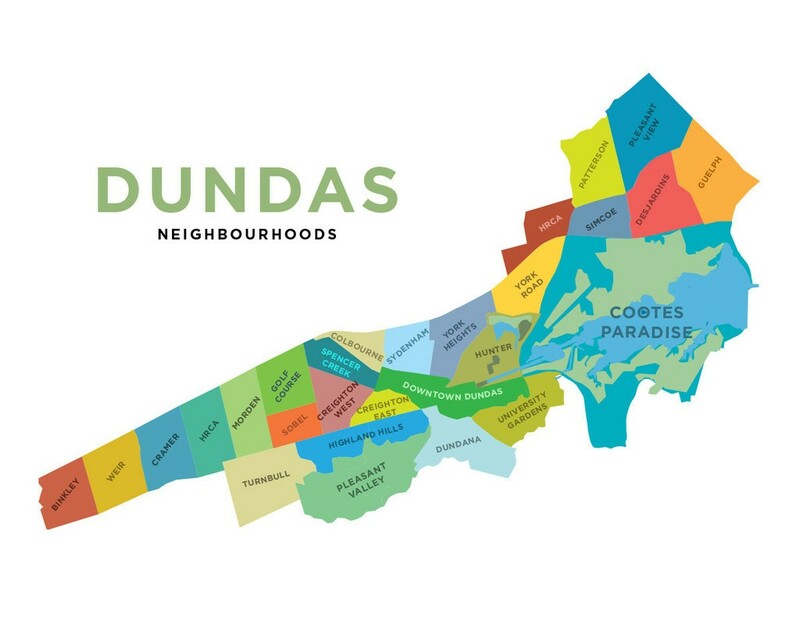 I lived in Dundas for a year, in University Gardens. For terminology, I’ll note University Gardens, Pleasant Valley, and Downtown Dundas as neighbourhoods. Otherwise, I’m noting location by citing the nearest major street such as Governors Rd, Syderham Rd, York Rd, or King St.
Winona, of course, gets referred to as Winona. This is all of Stoney Creek east of Lewis Road. Here’s a question I haven’t answered, where does Binbrook end and Glanbrook begin? For purposes of my stories, I’ll use Binbrook for the existing urban area, and proposed developments. For the reminder of Glanbrook, I’ll use reference points such as Highway 6, major intersections, and proximity to Binbrook and Mount Hope to describe location. I use the Ancaster Meadowlands for the newer parts of Ancaster east of the 403, Old Ancaster for the downtown area of Old Ancaster. Alberton, Carluke, and Jerseyville are referred to by their community names in stories, reflecting their continuing unique identities. Duff’s Corner’s remains a historical landmark at the intersection of the former Highways 2 and 52. Generally, I’ll use the community that individuals in my stories self-identify with. Someone may be just outside of the boundaries of a rural settlement, but still identify with it. I’ll use major intersections to try to place stories. I’m put out my view of Hamilton’s localism. I’m sure many of yours may differ. I’m especially interested in what your thoughts are for local boundaries in the former municipalities. Love this analysis Joey! I don’t know that I’ve ever lived anywhere that there were so many clearly (or are they that clear??) noted pockets and local identification whether it be positive or negative. One of the things I love about this place. Funny how the boundaries change. East End used to be Gage, if you pushed it, Sherman to Parkdale, bottom of the hill to the Bay. North End was reserved for anything, north of Cannon, west of Wellington. I was surprised the other day to have someone tell me I didn’t live in the East End, I lived in Central Hamilton. I am just west of Ottawa St. Living in the East End has always been a state of being as much as geography. Friendly helpful neighbours, smiles and hellos on the street and very proud Working Class roots and values. There were always economic divides in Hamilton, with the more desirable areas being predicated by their distance from the Steel Mills. The North/South divide seems to be mitigated these days west of Wellington, however is it alive and well in the more easterly portions of old lower city. The Mountain was just Up the Hill, with the east/west divide firmly entrenched anywhere outside of the older surveys east of Upper Ottawa. Of course, there wasn’t anything built on the flood plain back then, it was corn fields. Stoney Creek was the Crick and Dundas and Ancaster mythical places unless you had the position and money to live there! Every established neighbourhood has its own ‘high street’, with shops and post offices. Funny how we seem to be cycling back to the idea of a local shopping area. Thanks for this insightful article, Joey. Perhaps I can add some more confusion about Upper Stoney Creek / Stoney Creek Mountain. This area was officially dubbed “Heritage Green” in the original community development plan crafted by the Ontario Land Corporation in the late 1970s. The name was popular through the 1980s as the area developed, but seems to have gradually fallen out of favour, except for the area around Paramount Dr.
Folks in the new subdivisions springing up along the south side of Rymal Rd now seem to be embracing the name Hannon, which the post office imposed upon them. To add to this is the Spectator’s Saturday section SpecHomes like http://pages.cdn.pagesuite.com/c/b/cbde7cb6-eeb1-494c-a1ed-de013a8d9e30/page.pdf which is the page 2 of the section from 14 Feb 2015 and their map at the top which coincides with no know political boundaries that I can see. It confuses potential real estate buyers with yet another set of boundaries and different naming of areas. In some respects this map makes some sense but do we really need another delineation of boundaries? I realise that the Hamilton-Burlington Real Estate Board and its members are the buyers of this section’s space but would it hurt them to align with neighbourhood boundaries? Some folks look for specific neighbourhoods when shopping for a home. This is helpful. Hamilton is on my short list for a move next year. I’ll use your descriptions as I ride around the city. Helpful, would be a description of the character of the neighbourhoods. Are there any with the strong value of volunteerism and conservation that I see in Guelph? As a newcomer to Hamilton, I have seen and felt the huge gaps in the descriptions of what is a certain direction. 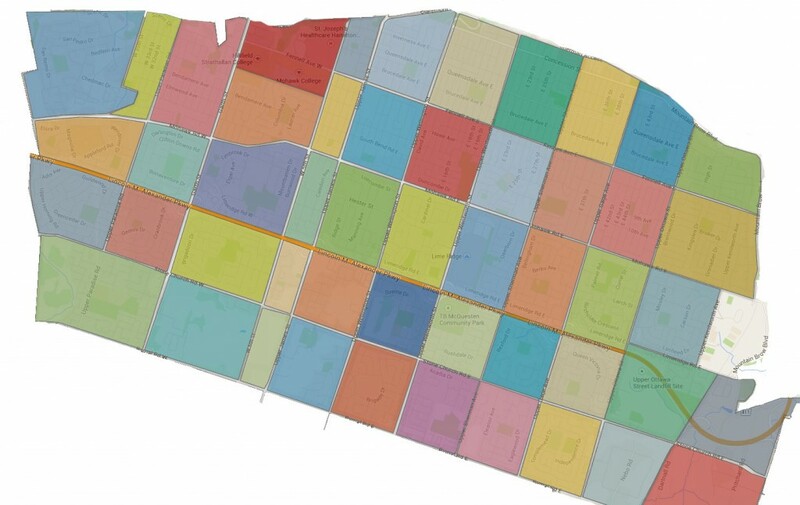 Is there no cut and dried standard of reference for the City of Hamilton’s geography? Some folks have been downright hostile when previous directions from other residents are repeated word for word. And some of their replies have been far less than kind. There is no cut and dried standard of reference for how people perceive their geography. There are political lines on maps, but as I noted in the article above, the reality on the ground is much different. People get hostile, unnecessarily, when their localisms are challenge. Admittedly, I get hostile with non-Hamiltonian journalists who call Westdale “North End” in a crime story. 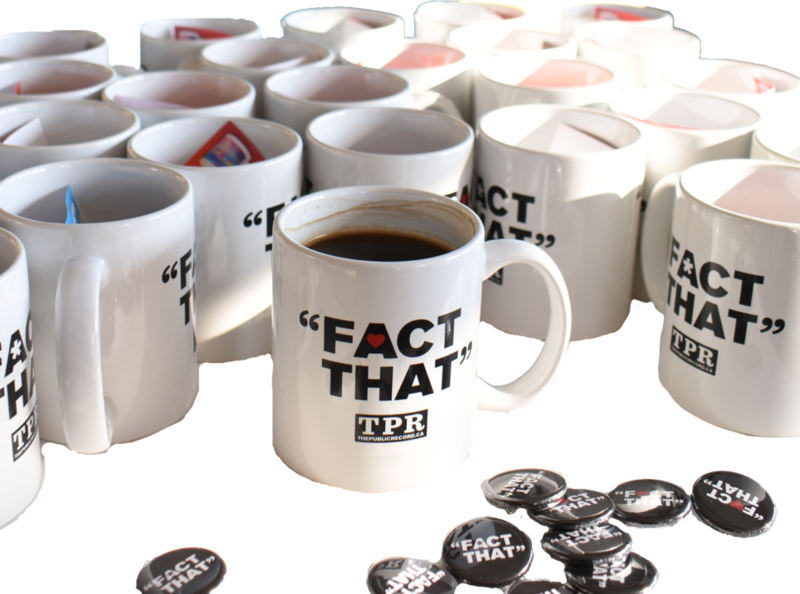 Don’t let the initial hostility from some discourage you from becoming an engaged Hamiltonian. Thank you kindly Mr. Coleman, we have decided to find a different location in another city for our family businesses. Three months was more than enough to convince us that we and what we had to offer, were not needed in Hamilton. In a modern world where traditional craftsman and their trades are becoming extinct, it is no wonder for some it is easier to move on rather than pass on the tradition. I have decided to retire earlier than planned, with no regrets. Thank you Hamilton, we will not return in the future. Our home sold in a matter of hours. I remember growing up that we were told that we came from West Hamilton, and the older neighbours told us at we were actual in the Gore of Ancaster….how although the annexation by Hamilton during the depression help them by giving them sewers, piped water and paving roads, the area was destroyed by the city, the example was given – filling of Brinkley Hollows marsh to build the hwy 8 bypass and the construction of the 403 hwy. I think the term ‘East End’ refers to an urban area of the Lower City with Wentworth as its western boundary, Ottawa Street in the middle, and Parkdale as its eastern boundary.